Yesterday, I spoke of the medical research behind my writing of Second Chances: The Courtship Wars. If you did not have the opportunity to check this information out, it is fascinating. Read it HERE. One of the things that struck me in the original article was the idea that women on birth control change their hormonal makeup, and, therefore, skew their natural instincts. Could this be a factor in the rise of divorces? Of miscarriages? LOL! I hold no means to know, but what an interesting concept! With that in mind, I give you the premise behind my contemporary romance, Second Chances: The Courtship Wars. Second Chances is a reality TV show in which couples who were once married and now divorced wish to remarry. The winners will receive the wedding of their dreams, as well as a substantial cash prize. As part of the show’s medical staff, psychologist Dr. Lucian Damron meets his match in Gillian Cornell, a sexologist. Lucian and Gillian are as of much interest to the American viewing public as are the contestants, and the show’s executives decide to highlight their growing romance to boost viewership. Needless to say, things do not go as planned. Worried she would be late for her university lecture, Gillian stepped onto the busy sidewalk. Digging in her purse for her sunglasses, an action, which seemed to claim more and more of her time each day, she did not notice Damron’s approach until the man stood before her. “Dr. Damron,” she gasped, reaching for her heart as if frightened. He reached to steady her stance, and Gillian felt the warmth of his touch scooting up her arm. “How did you know where I lived?” she asked suspiciously. “I was a bit tenacious in my efforts,” he admitted before releasing his hold on her arm. “I appreciate your concern, but I’m accustomed to making decisions without assistance from those I know little of,” she announced. Dr. Damron smiled, and Gillian realized a smile on his lips was a powerful weapon against her resolve. Deep set dimples. Like those found on Clark Gable. God! To be the recipient of that smile on a regular basis would be heavenly. “Naturally. I overstepped my boundaries. I apologize for intruding upon your privacy,” he said dutifully. Gillian placed her purse across her shoulder. She glanced around to hail a cab. “I’ve my care with me, might I offer you a lift?” he offered. Gillian’s eyes finally met his, and a tingle of anticipation rushed through her. The man did not wait for Gillian’s answer; he caught her elbow to lead her to his waiting car. In truth, as soon as he touched her, Gillian swallowed her refusal. The relatively short drive to the university didn’t allow for much conversation, but Lucian used it to his advantage. “What’s the lecture on?” he asked as he maneuvered through traffic. A lull in the conversation followed. Lucian did not know much about MHC, but he meant to learn something of it when he returned to his computer later. At length, Miss Cornell asked of his hopes for a talk show. Lucian watched her from the corner of his eye. He could read the moment of indecision swaying in his favor, and he relished the idea. At length, an aggravated sigh escaped Miss Cornell’s lips as she grudgingly accepted. “Good.” His heart lifted with anticipation. “Thank you, Gillian. Good to his word, Lucian sat in the shadows at the back of the auditorium, but that didn’t keep him from Gillian’s thoughts as she worked her way through the afternoon lecture series. Gillian thrust the microphone before the face of a bleach-blonde co-ed. “Sure,” the girl’s gum snapped as she answered. Gillian moved on to an older grad student. This time she turned to the “jock” type. The guy blushed when his obvious girlfriend playfully slugged his shoulder. Gillian’s eyes rose to where Dr. Damron looked on. An enigmatic smile played across his features, and Gillian fought the urge to ask him his thoughts on their previous encounter. Gillian returned to the stage to continue her thoughts. “Unless you live in the South,” a voice from the rear of the audience shared a bit too loudly. A nervous giggle filled the space. A light round of applause spread across the room, but Gillian raised her hand to let the attendees know she still required their attention. “Where you going?” A dark-headed prep shouted from the front row. Gillian glanced to Dr. Damron again. She hesitated before she offered an explanation. Gillian motioned for Dr. Damron to come to the front. Damron self-consciously came forward as the audience applauded. He hugged Gillian quickly – too quickly for her preferences – as he accepted the hand-held microphone from her and turned to face those gathered in the lecture hall. A sniggering voice penetrated the silence. “Like roses,” he responded with a light laugh. “Actually, it’s lavender,” Gillian corrected. Damron presented Gillian a knowing look before turning to the audience. Rushing through the concourse to make her way to the conference stage, Gillian Cornell comes face-to-face with the one man she finds most contemptible, but suddenly her world tilts. His gaze tells stories she wants desperately to hear. As he undresses her with his eyes, Gillian finds all she can do is stumble through her opening remarks. The all-too-attractive cad challenges both her sensibility and her reputation as a competent sexologist. Giveaway: Yesterday, I offered 2 eBook copies of Second Chances: The Courtship Wars to those who commented. I’m adding an additional two copies to this giveaway for a total of four. If you did not comment yesterday, do so, as well as leave your comments below. The winners will be chosen at midnight EDST on September 30, 2015. 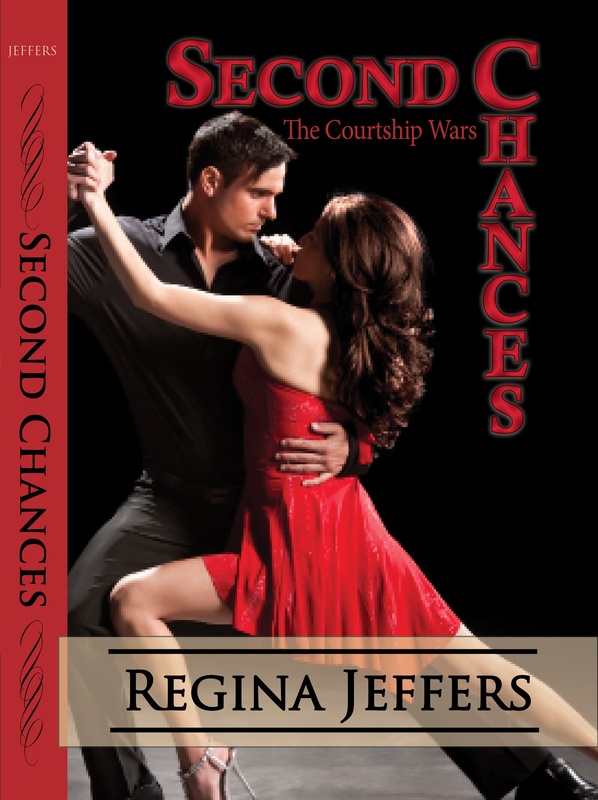 This entry was posted in contemporary, excerpt, giveaway, publishing, research, romance and tagged contemporary romance, eBooks, excerpt, giveaway, Regina Jeffers, research, Second Chances: The Courtship Wars. Bookmark the permalink. I am glad you enjoyed the excerpt. The excerpt is very good, Regina. I hope to read this book as I do love modern romance stories. Good morning, Sylvia. I thank you for your kindness.